Welcome to Angel's Academy. We are husband and wife childcare providers, that absolutely love caring for children. We have many years experience and well qualified. with lots of positive feedback from our lovely parents. Working as a team, is proving to be a very positive experience, as we are able to give the children more 1-1 interaction and plenty of individual attention, Which has had an excellent impact on the children in our care. We are really enthusiastic and aim in giving your child a safe and stimulating environment, where they can learn, play and achieve. We also want them to feel like they are at home. We provide daily hot and fresh home cooked meals with a cuisine from all around the world to enjoy, as we also have a multicultural setting. For your child to join our setting, please contact us to arrange an informal visit, where we can chat about your requirements and future plans, and how we can support you every step of the way, while knowing your child is safe and happy. I have worked as a childminder for many years, and in several nurseries, such as leapfrog and bushy tails as a nursery nurse. I also worked for sure start for several years and as a teaching assistant in a wonderful primary school. I have also worked as a creche coordinator. Recently i have also worked abroad as an English teacher, which was a lovely and rewarding experience. I have experience working within a school setting for children with severe Autism. I have an NVQ level 3 childcare certificate. paediatric First aid, which has been completed several times, Food hygiene and we are always undergoing further training to improve our setting. We have also attended a course for learning through play. Early years foundation stage updates- Wokingham borough council. We are very flexible, Currently doing pick ups & drop-offs to Old basing infant school. Below are the latest reviews for Angels A. Please note that reviews represent the subjective opinions of other Childcare.co.uk users and not of Childcare.co.uk. Parents must carry out their own checks and references on childcare providers to ensure that they are completely happy before enaging in the use of their services. By far the best childminders in the area. My little boy has spent the past 8 months with angels academy and has developed so much due to the care he receives. Communication is good and if I have any worries or concerns they are quick to reassure me. Photos of his learning and interaction in a wide range of activities are sent to me regularly which are lovely to receive. 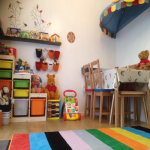 I feel he is cared for to the highest of standards and I have visited a fair few childcare settings around the area but can't find any as that live up to the high quality of Angels academy. Our son Quinn has been attending Angel Academy for a while now and absolutely loves it! He is always so excited when we drop him off and loves seeing all of his friends there. Sophie and Hany make amazing meals for the kids, I wish I could stay for dinner sometimes when I smell what’s cooking! Quinn is a very energetic little boy and Sophie and Hany provide a great balance of letting him run around and also helping him to concerntrate on tasks like painting and imaginative play. Would recommend Angel Academy to any parents or caregivers looking for a warm loving and fun environment for their children to learn and grow in. Isla has been with Sophie for a while now and she loves going every time. She gets to eat lots and play all day which is perfect for her as she loves to do both. Sophie and Heny provide a safe and secure environment for her and understand her needs perfectly. I even get regular pictures of the activities Isla does and we get all of the pictures and paintings she produces. Isla also has a daily diary of what she has done. I would recommend anyone to use their services as Isla has developed so much whilst being there. She learnt how to walk and even started speaking and for that I am eternally greatful. Our son has been in the care of Sophie and Hany for more than 4 months now and me and my husband are extremely happy with the love and care he is receiving there. My son’s school is a bit far from Sophie’s place but still she agreed to do the school pick ups which is a great relief for us and also they understand the needs of working parents very well and we do not have to panic if we reach a few minutes late to pick him up in the evening. Our son has multiple food allergies but Sophie always takes great care to ensure that he is not exposed to any food that he is allergic to. Also Sophie does the reading homework with my son which is a great bonus for us. Thank you so much Sophie and Hany for taking such good care of Ayaan, he is very happy in your setting and I would highly recommend you to any parent looking for a great childminder. Thank you so so much Sophie and Hany words can't express how grateful l am for looking after Henry. You are always willing to help even when l give you short notice to care for Henry when l was admitted in hospital. I also learnt a lot from you for advice you gave to me about Henry's wellbeing whenever l ask a question or don't understand anything you take your time and explain things to me. Finding a childminder to care for your child is a very difficult decision for every parent but when l leave Henry with you l know he is in a safe hand. I will highly recommend you to every parent who needs childminder. I will always keep in touch as Henry and his new baby sister will come when l start work again. Thank you and continue with your good work. God richly bless you both.